"Shock and awe in college basketball! 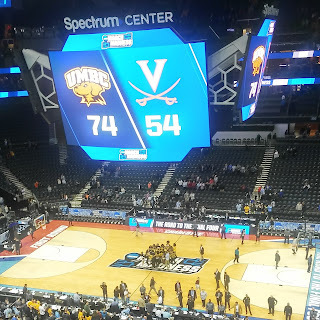 UMBC makes history in Charlotte!" Those words, spoken by Bill Raftery on the TNT broadcast of UMBC's historic victory over #1 overall seed Virginia, may go down in NCAA Tournament lore. I watched on an otherwise unremarkable Saturday afternoon with admittedly few expectations. A friend messaged me after Jairus Lyles' game winning not-quite-buzzer-beater fell and our dance card was punched. 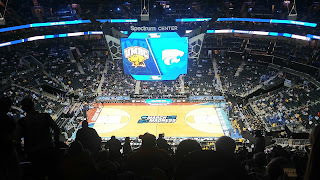 A decade prior, I watched UMBC win at home in the conference final to secure the first trip; this victory came on the road as the #2 seed against a team that has bested us the 23 previous outs. Because I already had another reason to familiarize myself with first round tournament sites, I knew that there was a site that would be most advantageous for me: Charlotte. 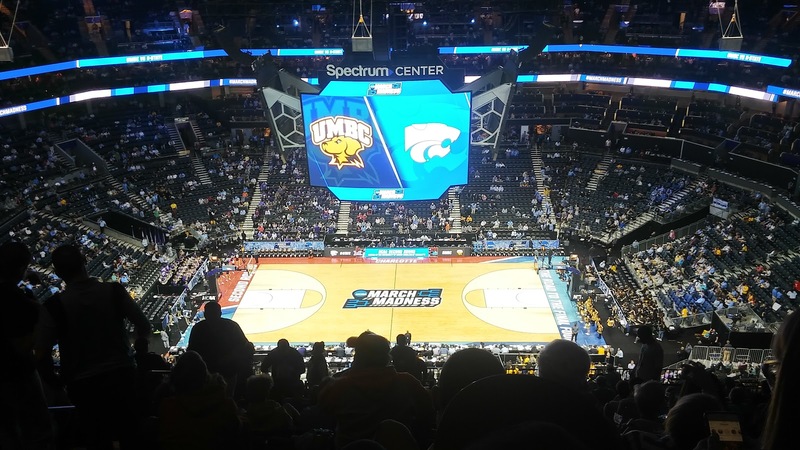 UMBC's postseason history in North Carolina has been strong across sports, and sure enough, Charlotte it was. My attendance from the moment they announced it on Selection Sunday was never in question. I made the trip down to Charlotte on Friday afternoon, and headed to a pregame social at the team hotel. 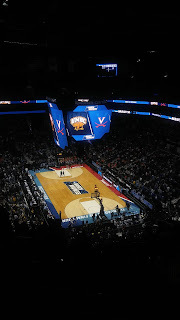 I made a mutually beneficial agreement with a then-stranger, now-friend fellow alumnus: He was in from Atlanta; his hotel was adjacent to the arena and came with parking. I'd give him a ride back uptown after the social, and park in his designated spot. Works for me. I met Jeremy at the social, and got to catch a few more familiar faces: Nancy, my Director of Residential Life from my undergraduate days who is now the Vice President for Student Affairs; Cara, our mascot emerita who worked this game who I had the pleasure of meeting a few years back at Spirit Groups Alumni Day; Talmesha, a dance team contemporary of mine who now coaches her former squad; and of course our esteemed president, Dr. Hrabowski. I also got to see quite a few other alumni, employees, family members, and fans, and the current iteration of the Down and Dirty Dawg Band. My usual predilection towards seeing games and bands gave way to the intent to be all in for my team. The pregame social and team sendoff lasted into the first game of the session (Kansas State vs. Creighton) but I didn't mind. After we saw the team and spirit groups off, we headed uptown to the arena, where I caught some of the second half of that game (and gave y'all a little #bracketbands) before the good guys took the court. Thanks to a bit of wheeling and dealing by our Director of Alumni Relations, I got to sit with Jeremy rather than in the solo seat I had purchased from StubHub, so I had someone with whom to share history. The first half was a low scoring back-and-forth; by the under-12 timeout, both teams were still in single digits, and the first half ended tied at 21. While there was still a half of basketball still to be played, this didn't feel bad, as a fan of the team who by all intents and purposes should have been getting their teeth kicked in. UMBC's defense stayed tight as the offense heated up in the second half. By the under-16 timeout, UMBC led by 11, and would never hold a smaller lead the remainder of the game. It was at about that point that the win probability flipped in UMBC's favor as well, though I've spent enough years rooting for losing programs that I wouldn't have believed it if you told me. It started to feel real around the "fourth quarter" - 10 minutes remaining in the game. By that point, UMBC led 47-31 with no signs of letting up. Everyone not clad in orange and blue was rooting for history by then, and the Carolina fans who had moved down to enjoy the game with us pointed out, accurately, that UVA wasn't built to come back from a deficit. 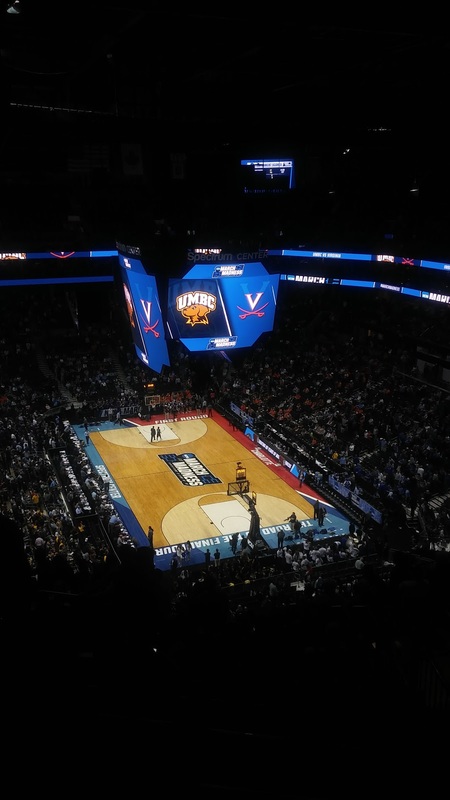 UVA's deficit would never again fall within a dozen, and UMBC would go on to win by 20. At some point late in the second, the students, who like us were in the arena's upper deck, saw a victory at hand and made their way down to the lower level to prepare to celebrate. After the game went final, the pep band pivoted deftly from the fight song and alma mater into All I Do Is Win and an all out party. An unnavigable crowd at the escalators led us to enjoy the celebration mostly from the upper deck, eventually making it down below before being politely but firmly ushered out by arena staff. I should mention that from the point of inevitability on, my text and social media blew the hell up. My affinity for UMBC is pretty well documented, and everything from congratulations to wellness checks came my way. I assured folks I was, indeed, still alive, and went live on Facebook from outside the arena. A crowd stuck around for some live video from the local news. I'll remind you that this was the session's late game, so it was pushing midnight at this point, but I was nowhere near sleep. Several of us kept the party going at World of Beer in the Epicentre, reflecting on the day and cheering at the SportsCenter highlights on the bar TVs before calling it a night, and my departure back up to Greensboro. I wasn't the only one who had to make a change in plans - after all, 135 previous attempts would have told us not to plan for a repeat performance as a 16 seed. I actually had a work obligation on the Saturday that followed, and despite finally getting into bed around 4:30am, I was still plenty energetic by the next day, though I crashed hard Saturday night. Sunday's game was at 7:45, so I had a good deal of family time, including a hike, prior to heading back south to Charlotte. I ended up paying more than face value for Sunday's ticket, due largely to UNC playing but certainly at least in part to interest in lightning striking twice for UMBC. I made my way down to Charlotte just in time to see disappointed Carolina fans streaming out of the Spectrum Center, having just witnessed a drubbing at the hands of Texas A&M. From a fan perspective, we were playing with house money by the game against K-State. A win here and a Sweet 16 berth would have been icing on the cake, but at the same time, we just knocked off #1; who should we fear? After nearly 48 hours of press, one thing was for sure: We wouldn't have the element of surprise on our side. UMBC once again got after it defensively, though shots didn't fall as they did on Friday night. To our players' credit, they shot with no memory, but despite being in it all game long, the clock ultimately struck midnight on our Cinderella run as the Retrievers fell, 50-43. The pep band got out the fight song and alma mater before yielding to the victors, and the team got nothing but congratulations from the whole arena, As it had two nights prior, the night once again ended at World of Beer before hopping on I-85 northbound with nothing but pride in the alma mater.